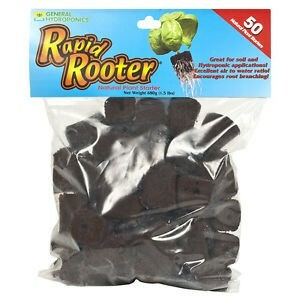 Rapid Rooter plugs are all natural soil-less organic grow plugs made of composted tree bark and organic materials. These plugs are perfect for seedlings or cuttings. Transplant plugs in soil or soil-less hydro-gardening applications. Rapid Rooter’s breakthrough technology produces a unique matrix of composted organic materials bonded together with plant-derived polymers. Rapid Rooter plugs are manufactured using a scientifically controlled process that yields large populations of beneficial microbes in the media. These naturally-occurring microbes colonize young roots, helping plants resist disease while maximizing nutrient uptake.